It’s that time of the year again: cold and flu season. 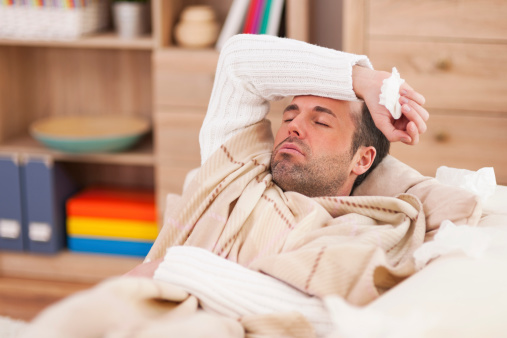 Oftentimes, no matter what precautions you take, you end up sick and miserable in bed. How can you be living the good life if you’re out of commission? Once you succumb to illness, you might try over-the-counter antihistamines, cough suppressants, and decongestants—and you might have found that most of them were ineffective. Furthermore, you might suffer side effects, such as drowsiness, dizziness, or insomnia. It’s only natural to want relief when the symptoms of cold and flu have us down. But perhaps there are better treatments—which are more effective, more natural, and more affordable—than official-looking boxes with their long lists of chemical ingredients. Surely you know the expression, “Feed a cold, starve a fever.” There’s a lot of truth to it. The age-old wisdom that you should rest and drink plenty of fluids also applies. Unless the symptoms you’re experiencing are actually caused by a bacterial infection (and not influenza or the standard cold), you do not need an antibiotic: these do not treat viruses. In terms of treatment, there are many foods, vitamins, and botanicals that will help you get healthy. With the common cold being so “common,” it’s not surprising that people have been cooking up home remedies for hundreds of years. And when it comes to colds, the idea of “healing foods” really applies: you’ll find many therapeutic treatments at the grocery store—not the drug store. There’s nothing like hot spices to clear congestion. Spicy foods are “mucokinetic”—that is, they trigger the release of fluids that shift the mucus that’s clogging you up. In fact, capsaicin, the hot component of chili peppers, is similar to a drug that’s used in commercial cough medications. Horseradish also contains ingredients similar to the chemicals used in medications. Garlic is one of the reasons that chicken soup is a popular folk remedy. Research from Brigham Young University shows that garlic can kill the human rhinovirus, which causes colds. Alternative medicine guru Dr. Andrew Weil also recommends garlic for colds. He tells people to eat cloves of raw garlic—one or two a day—when they first experience symptoms. If you can’t stand chewing it raw, he suggests chopping the cloves into chunks and swallowing them like pills. Another ingredient that is also added to chicken soup is onion. Onions contain many of the same antibacterial components as garlic. If you’re tough enough to eat a whole Spanish onion before you go to bed, health food authorities say you’ll wake up feeling fine in the morning. Those of us with fainter hearts can slow-cook onions in honey and take the mix by teaspoonfuls at regular intervals. Singers take honey to coat their throats before performing. The rest of us will find it soothes sore throats, too. The best way to take honey when you have a cold is to mix it with fruit juice or herbal tea for the extra shot of vitamins. Ginger is a natural antiviral, and it’s just the thing to take when you’re coming down with the flu. Like garlic and onions, you can take it raw, or you can make a soothing cup of ginger tea. Pour two cups of boiling water over half a cup of freshly grated ginger in a pot and let steep for 15 minutes. Before serving, add hot sauce, lemon juice, or honey, according to your taste.